Today is Thursday, November 10, the 315th day of 2016, with 51 days remaining. There are 14 days until Thanksgiving, 41 days until the winter solstice, 43 days until Festivus, 45 days until Christmas Day, and 71 days until Donald Trump becomes president of the United States. 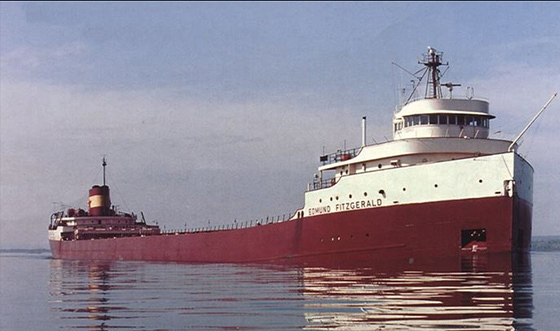 On this day in 1975, The S.S. Edmund Fitzgerald sank in a storm on Lake Superior, with the loss of the entire crew of 29. When launched on June 7, 1958, she was the largest ship on North America's Great Lakes, and she remains the largest to have sunk there. The sinking led to changes in Great Lakes shipping regulations and practices that included mandatory survival suits, depth finders, positioning systems, increased freeboard, and more frequent inspection of vessels. Among other things, today is also National Vanilla Cupcake Day. Cupcakes are called “fairy cakes” in England. The name is inspired by the idea that the miniature cakes are the perfect size for a party of fairies to enjoy. Florida man breaks into home, cooks and eats pizza while inside.He also took $35 in cash. His fingerprints were found on the pizza box. As of this writing, The KGB Quotations Database contains 41,212 entries. Check it out. Martin H. Fischer, German-American physiologist; Neil Gaiman, English author; Oliver Goldsmith, Irish novelist, playwright and poet; Vachel Lindsay, American poet; Martin Luther, German professor of theology, composer, priest, monk, and a seminal figure in the Protestant Reformation; John P. Marquand, American writer; Friedrich Schiller, German poet, philosopher, physician, historian, and playwright; and Patricia Wentworth, British crime fiction writer. "Where there is much freedom there is much error." 'Not Our President': Protests Spread After Donald Trump’s Election. Thousands of people across the country marched, shut down highways, burned effigies and shouted angry slogans on Wednesday night to protest the election of Donald J. Trump as president. The demonstrations, fueled by social media, continued until the early hours of Thursday. The crowds swelled as the night went on but remained peaceful. Protests were reported in cities as diverse as Dallas and Oakland and included marches in Boston; Chicago; Portland, Ore.; Seattle and Washington and at college campuses in California, Massachusetts and Pennsylvania. Sarah Palin as Secretary of the Interior? Another Goldman Sachs alumni as Treasury Secretary? The potential nominees for Trump's cabinet are mirroring satirist Andy Borowitz' predictions from a piece in the New Yorker. History tells us what may happen next with Brexit & Trump. It's not pretty. Has Donald Trump broken the Constitution? Donald Trump ran on a platform of relentless, thoroughgoing rejection of the Constitution itself, and its underlying principle of democratic self-government and individual rights. True, he never endorsed quartering of troops in private homes in time of peace, but aside from that there is hardly a provision of the Bill of Rights or later amendments he did not explicitly promise to override, from First Amendment freedom of the press and of religion to Fourth Amendment freedom from “unreasonable searches and seizures” to Sixth Amendment right to counsel to Fourteenth Amendment birthright citizenship and Equal Protection and Fifteenth Amendment voting rights. Like an admissions officer at Trump University, he offered Americans a bag of magic beans and asked them in exchange to hand over their rights and their form of government. Tomorrow is Veteran's Day, and we're off. See you on Monday!